Soak up the Spanish sun and get your fix of the best live music acts around at FIB Benicàssim. Vetusta Morla, the most important indie rock group to have emerged from Spain in the last decade, have been added to the line-up for FIB 2019. Fatboy Slim returns as headliner to the Festival with an impressive show, along with Kodaline, Gerry Cinnamon, Octavian, Belako, Soleá Morente & Napoleón Solo, La Zowi, Mueveloreina, Mavi Phoenix, Paigey Cakey, The Blinders and Barny Fletcher. 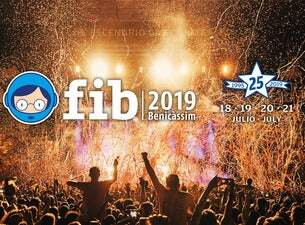 2019’s party already includes headliners Kings Of Leon and Lana Del Rey in their only appearance in Spain plus brilliant artists such as The 1975, Franz Ferdinand, George Ezra, Jess Glynne, Blossoms, La M.O.D.A.,You Me At Six and it doesn’t stop there for FIB 2019. we want to celebrate our 25th edition of the festival here with you.